Thirty second- and third-graders who wouldn’t typically have the opportunity to attend a summer camp participated last week in an enrichment program hosted by a group of Bullis Charter School parents. The students, English-Language Learning and Free and Reduced Lunch students from the Los Altos and Mountain View Whisman school districts, attended the tuition-free Bullis Boosters Summer Bridge Camp. The charter school parents who founded the camp collaborated with teachers from Castro School in Mountain View and Los Altos School District parents to reach the students they wished to serve. “We wanted to provide kids a little bit of a refresher before schools started, especially the kids who really don’t have access to a school experience,” said Grace Yang, a charter school parent who helped manage the camp. Charter school parents oversaw the Summer Bridge Camp, and teachers from the charter school and Castro taught the classes. Bullis Charter School junior-highers volunteered as counselors in training. The organizers rented classrooms from the Los Altos School District. It’s not affiliated in any way with the district or Bullis Charter School, Yang said of the camp. “I think the beautiful thing is we have vendors from the town supporting us, we have LASD parents who love it and said, ‘Let me help you,’” she said. 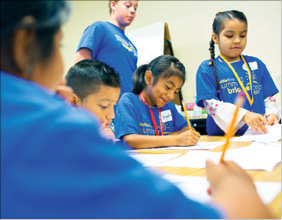 The 7- and 8-year-old campers spent each morning focusing on grade-level math skills, English language arts and reading. In the afternoons, the campers participated in hands-on science projects to cultivate interest in science and math. The students disassembled disk drives and watched in real time how a drive physically conducts a memory search. They built and launched homemade duct-tape rockets and constructed electronic circuits from lemons and wires. The final day of the camp culminated in three Stanford University electrical engineering graduate students conducting experiments using polymers, structural matter and clocks. The accredited teachers volunteered their time to develop the curriculum and teach at the weeklong camp. Local merchants donated lunches and supplies, including Lulu’s, The Boardwalk, Spot Pizza, The Counter, Whole Foods and Linden Tree Books. Donations from Bullis Charter School parents covered the cost of materials and the rental of two Bullis Charter School classrooms from the Los Altos School District. Yang said she was pleased to see so many people from the community coming together to contribute.